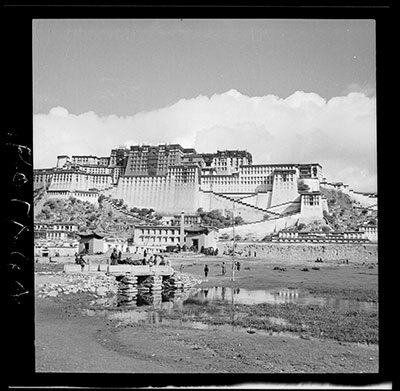 The Potala from the south. The Zhol pillar may be seen in the centre of the image and there is a stone beam bridge in the foreground with people crossing it. The Tibet Album. "Potala from the south " 05 Dec. 2006. The Pitt Rivers Museum. <http://tibet.prm.ox.ac.uk/photo_2001.59.8.50.1.html>.